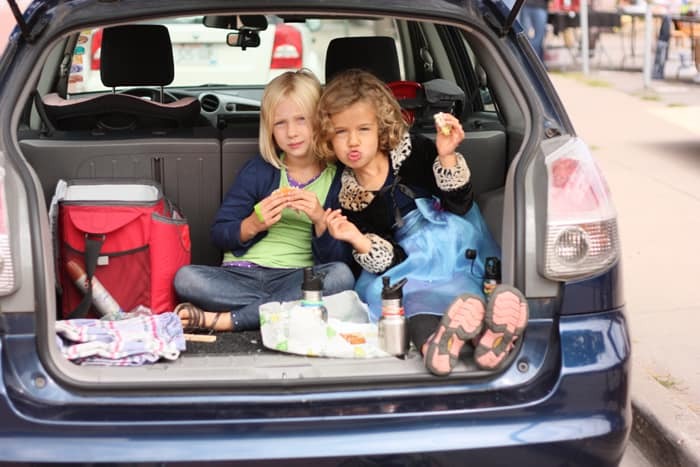 A picnic can be anywhere you want it to be, even in the trunk of a car. One of portion of our family’s mission statement is to find adventure. So often when we think of creating “adventure” for our kids it involves spending money or vacationing. The truth is, everyday things can become adventures with a simple change of scenery. Last week, the girls and I had plans to picnic at the park and then head to the farmer’s market. Unfortunately, we had to cut the day short. I popped the trunk and in the middle of downtown we had a picnic in the back of the car. The girls thought it was literally the coolest thing ever. Have dinner alfresco: use your patio set, pack a picnic, enjoy the fresh air. Have an indoor picnic and eat dinner on a blanket in your living room. Break the norm (and it will become a memorable adventure).